Last year the Society submitted a grant application for $1,200 to the Union Pacific Foundation for funding of replacement panes for CP 29's clearstory windows. In early February the Foundation notified us that they will not be able to fund our project due to budget limitations. Being turned down in our request this time is unfortunate. But we will apply again this summer for funding of the pedestal pattern and castings. 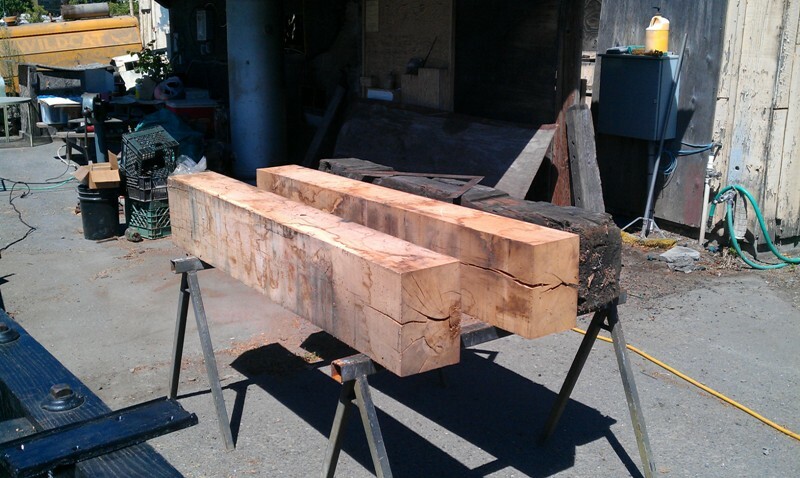 As received from Channel Lumber in 2012 the four end beams, four wheel pieces, four transoms and eight safety beams were sawn to the correct profile but slightly longer than the original pieces. Last fall the ends of each piece were rough-shaped with a large band saw to match the original. Then we began the final shaping. Each tenon has to be trimmed, shaped and beveled on its leading edges, and the corresponding mortise must be enlarged and deepened with hammer and chisel as necessary to get a tight-fitting joint. The process is a slow one because the oak timbers are dense and tough. This January we continued with the final shaping. A few more work sessions will be needed before all the joints are properly fitted and assembly of the frames can begin. 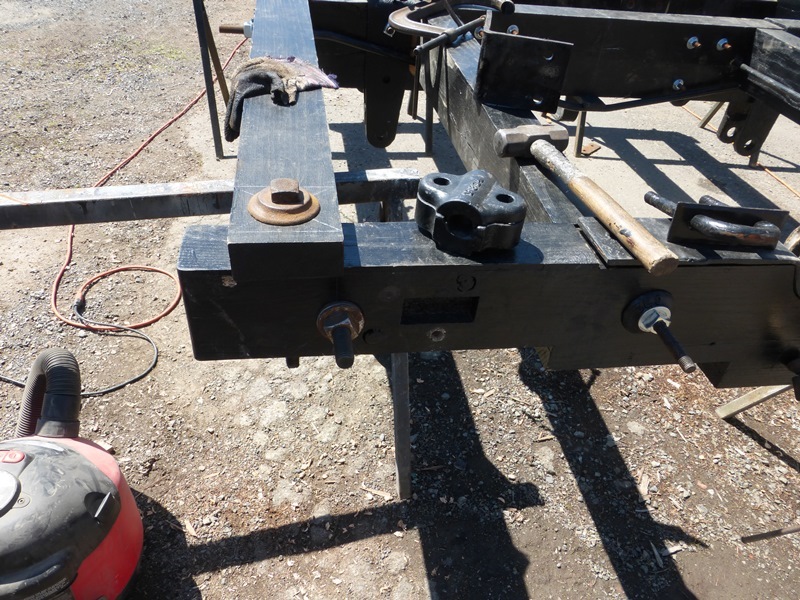 Just as when we worked on Caboose 1, the ten pieces of each frame will go together quickly and be pulled tightly together with new and refurbished bolts and rods. 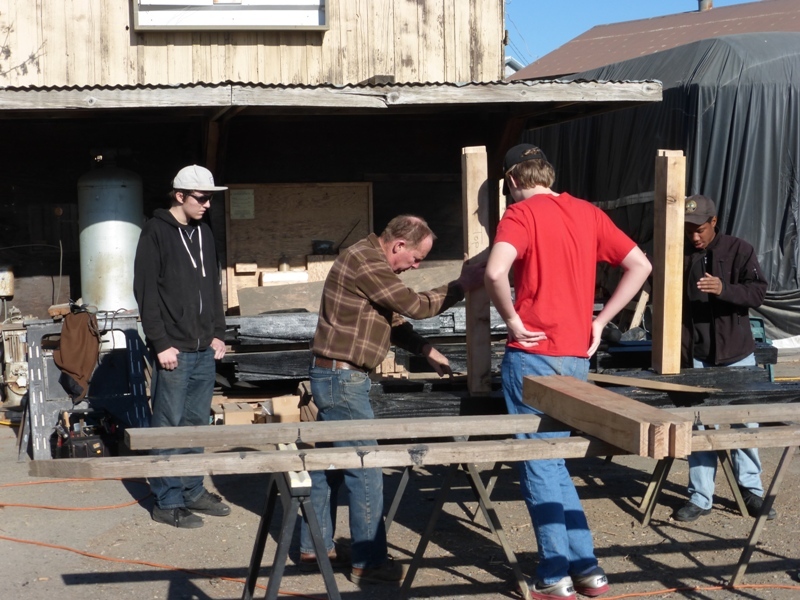 Photo 1: The young work crew, learning a new craft, lead by Jeff Millerick. Photo 2: All hands on deck as the beams for the truck frames are being prepared. 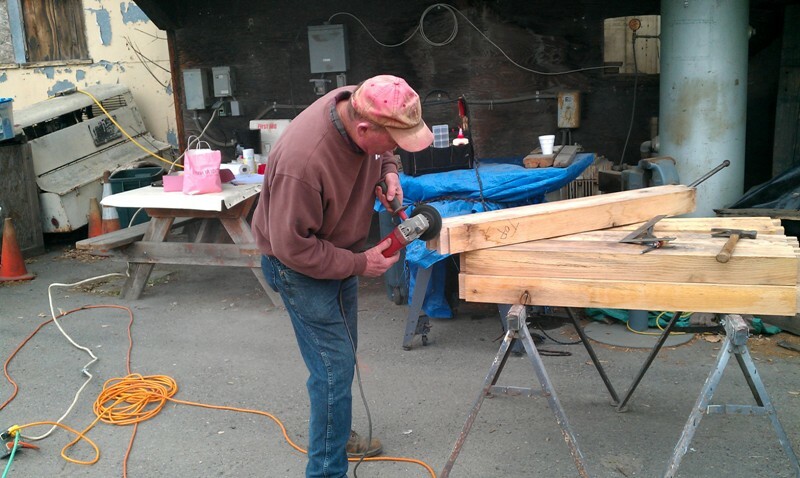 Photo 3: Jeff Millerick grinds the end into shape. Photo 4: Steve Atnip test fits a mortise and tennon joint. 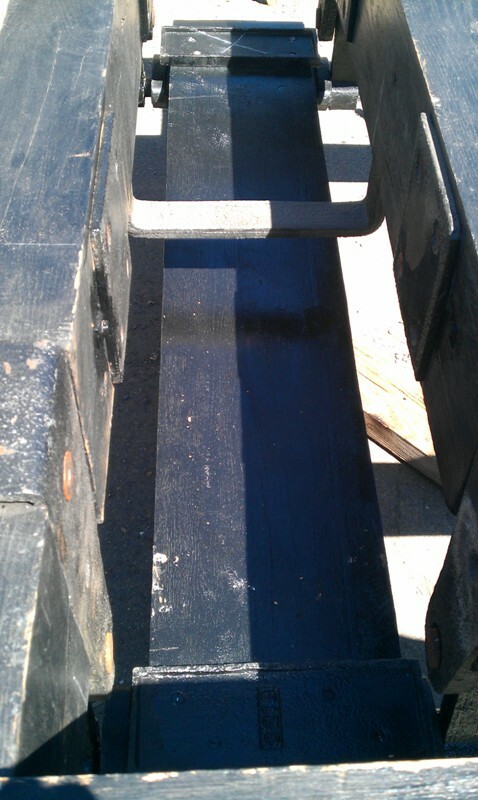 As we mentioned in the last issue, the final fitting of the truck beams continued until each piece fitted properly. Assembly of the frames began in mid-February. One by one the beams were set in position then clamped. Holes were drilled where needed. 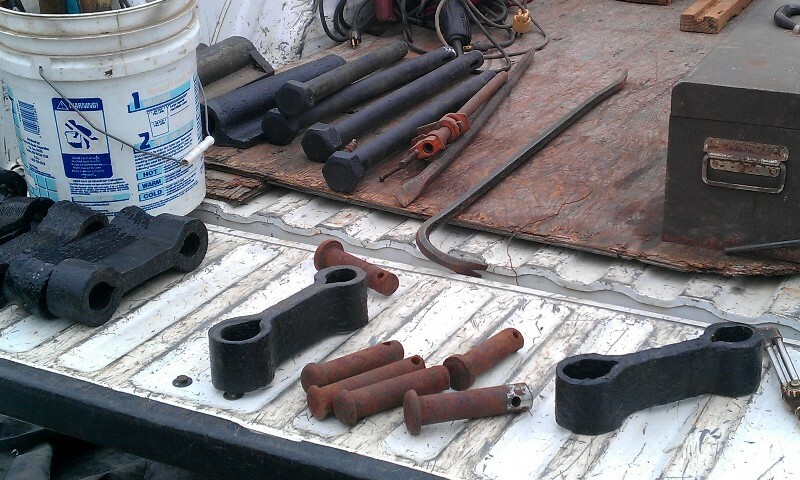 Tie rods and bolts were rethreaded and reused when possible. If not, they were replaced. The 3/4-inch rods and bolts salvaged from B&O 20 were inserted into the holes, washers and nuts slipped into position and the nuts tightened. 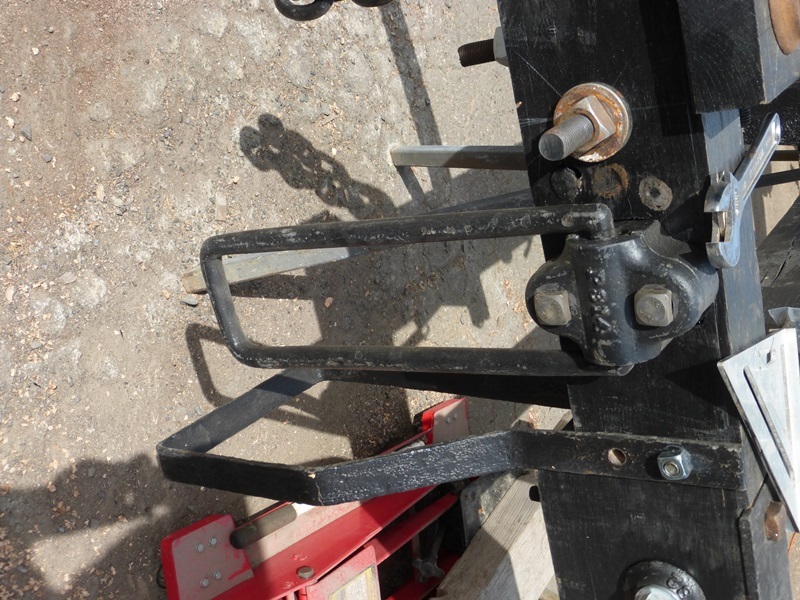 The work session on April 5th saw the corner bolts inserted and tightened, and B&O 20's brake hangers bolted onto the end pieces. The next session (after the Headlight deadline) will see the brake release springs attached. Soon after that the truck frames will be ready for installation of pedestals. Unfortunately, the pedestals we have are not of the correct style. To finance the pedestals the Society is starting a new campaign: "Buy a Pound of Pedestal". Your generous donation of $10 will cover the prorated cost of the patterns, steel, sales tax, energy and labor needed to cast one pound of a pedestal for CP 29 and bring it to the De Carli Trolley Museum. If each member contributes $30 we will have enough to place an order for the castings immediately. Please send a donation today so the Society can continue the restoration of this historic car. Photo 1: Jeff Millerick with the drill is making a lot of chips while places a bolt in the prepared hole. Photo 2: The basic truck frame is assembled. Photo 3: Both truck frames with a coat of paint bask in the sunshine..
Photo 4: Archive photo of a truck from a sister car. 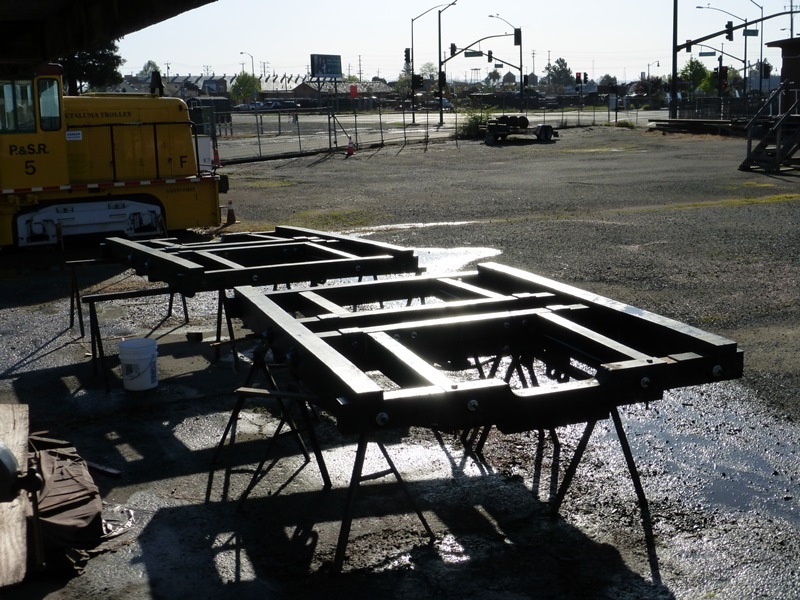 Photo 5: Starting to assemble the extra parts of the truck frames. 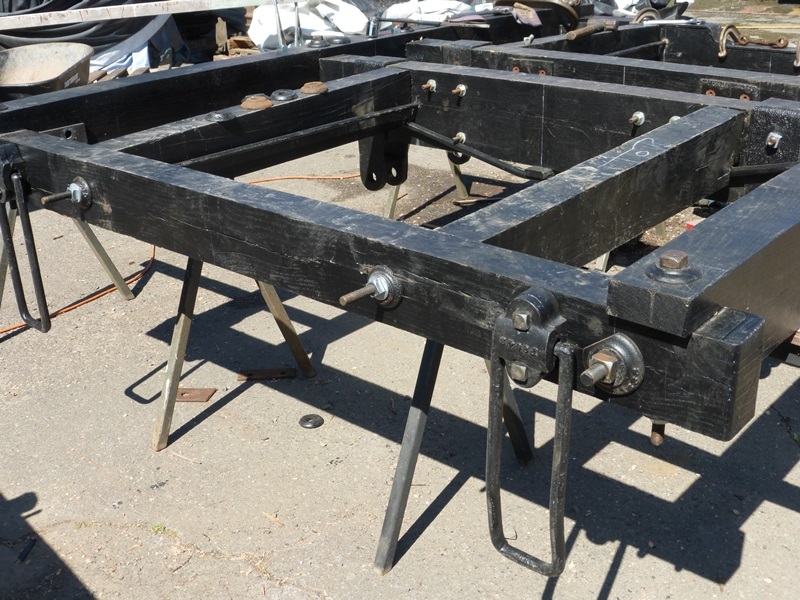 The truck frames are finally assembled using new and recycled bolts and tie rods. With the exception of the pedestals, wheel sets and brake gear, all hardware that can be bolted to the frames has been added. We must wait until the pedestals are cast before assembly can proceed. As mentioned in the previous issue, we are financing the creation of a pattern for the pedestal and the casting of eight pedestals with our "Buy a Pound of Pedestal" campaign. Over $1200 has been raised so far, but more is needed. Your generous donation of $10 will cover the prorated cost of the patterns, steel, sales tax, energy and labor needed to cast one pound of a pedestal for CP 29 and bring it to the De Carli Trolley Museum. Please send a donation today so the Society can continue the restoration of this historic car. 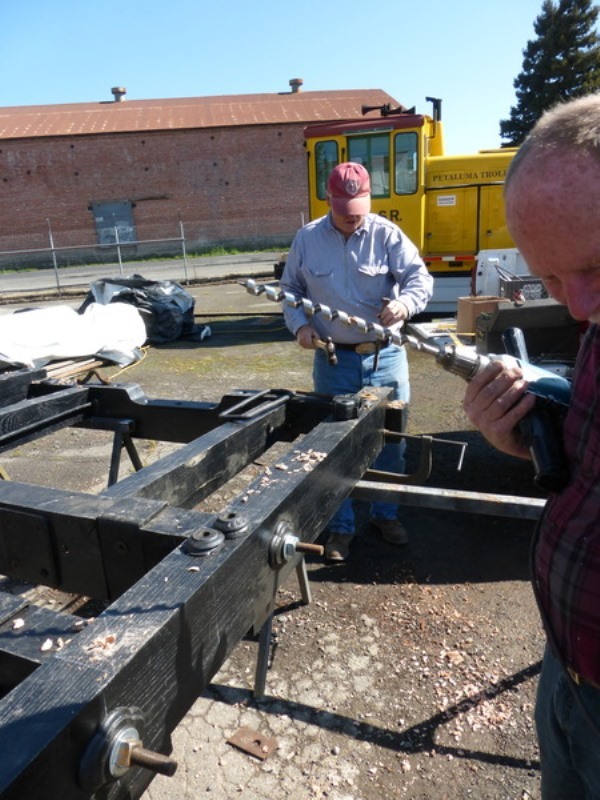 Last February the Society purchased a pair of narrow-gauge wheel sets from a retired logger in Oroville. These were salvaged from the site of an incline railway. 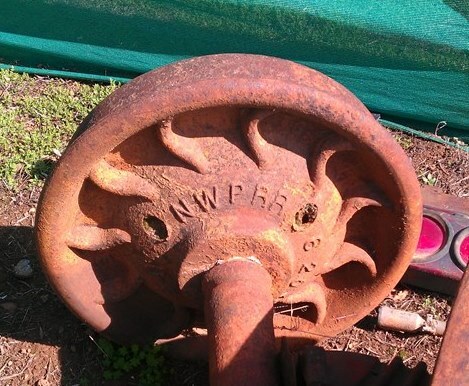 Each of the wheels was cast in 1907 by the Saint Louis Car Wheel Company, and has the letters "NWPRR" cast into its back face. Jeff Millerick had located these wheel sets and negotiated their purchase. 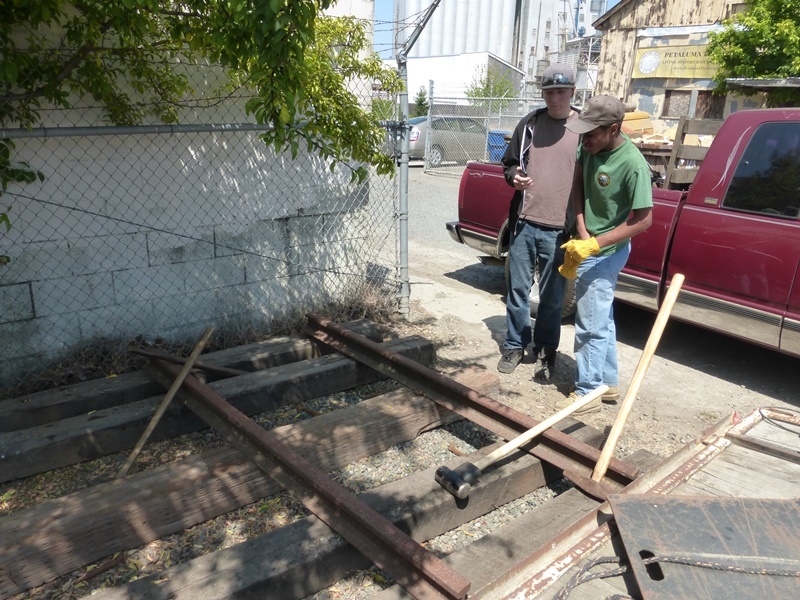 He also donated a pair of rails to build a display track at the De Carli Trolley Museum. The track was built by Steve Atnip, Dave Dietz, Jelani Hall, Demitri Kosdrosky and the author. An added bonus to the "NWPRR" letters is that four journal boxes came with the wheel sets. 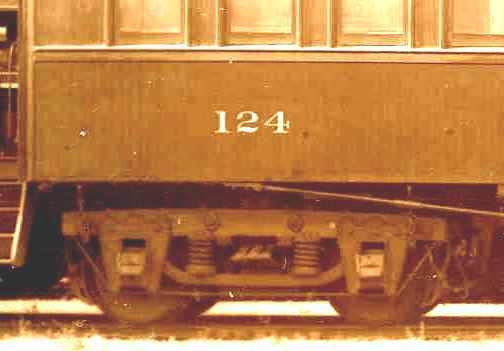 One axle has a journal box at each end. Three of the box lids have a 5-pointed star cast into them. The star is the emblem or trademark of the Carter Brothers, who built much of the narrow gauge rolling stock of the North Pacific Coast Railroad, a predecessor of the NWP. These journal boxes and wheel sets will be studied by fans of the NPC to determine their rightful place in the history of that railroad. Photo 1: More parts are addeed to the truck frames. Photo 2: It is quite a job to place all the extra parts in the correct positions on the frames. Photo 3: Making a part fit. 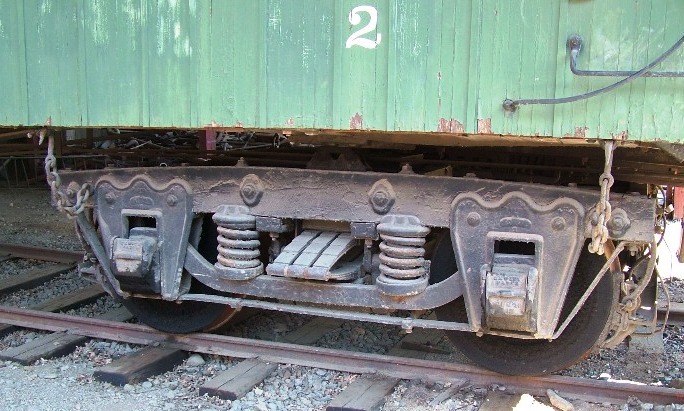 Photo 4: Narrow gauge (3') wheel sets found by Jeff Millerick in Oroville CA. 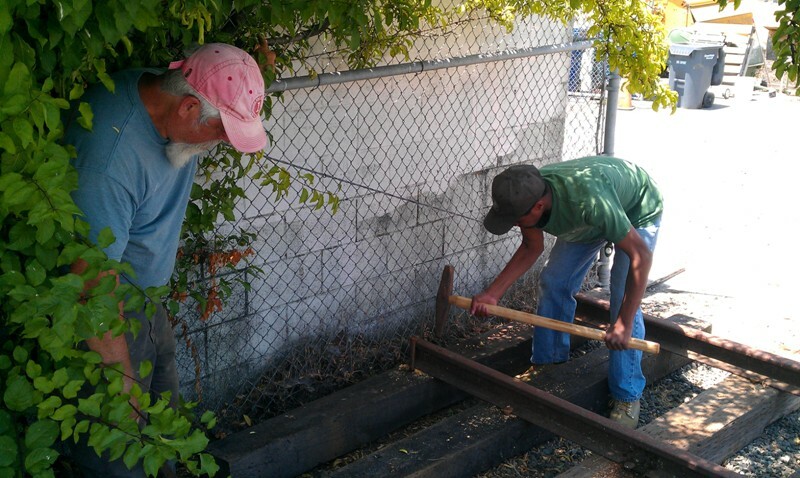 Photo 5: Assembling the rail for the narrow gauge wheel sets. Photo 6: Inside of one of the wheels reveals that it was cast for the NWPRR. Photo 7: Jelani Hall driving spikes to secure the rail to the ties. 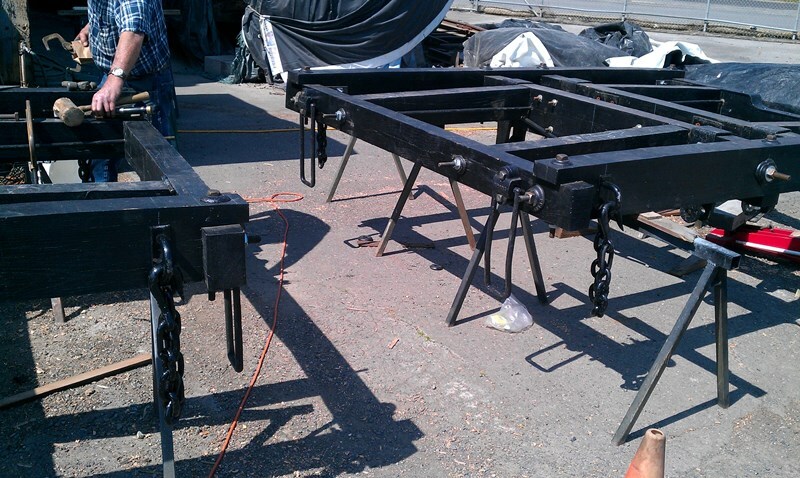 With the exceptions of the pedestals, wheel sets and associated hardware, the truck frames are assembled. 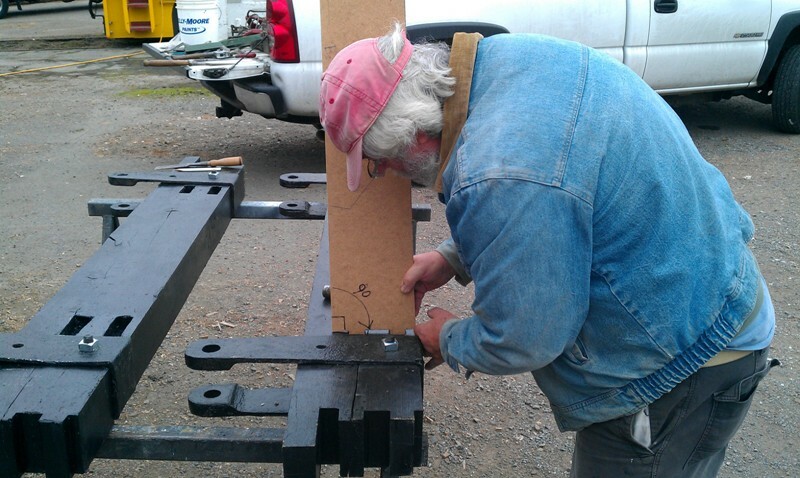 A spring plank has been fitted to each truck frame. Each plank end is supported by a pair of hangers and a thick rod. Sitting on top of the plank will be two sets of triplet elliptic springs, one set at each end. These in turn support a solid oak beam 8 inches high, 11 1/2 inches wide and 67 inches in length, known as a truck bolster. In the center of the upper face of the bolster will be the truck center plate. It will support the body center plate when the truck is positioned beneath CP 29. 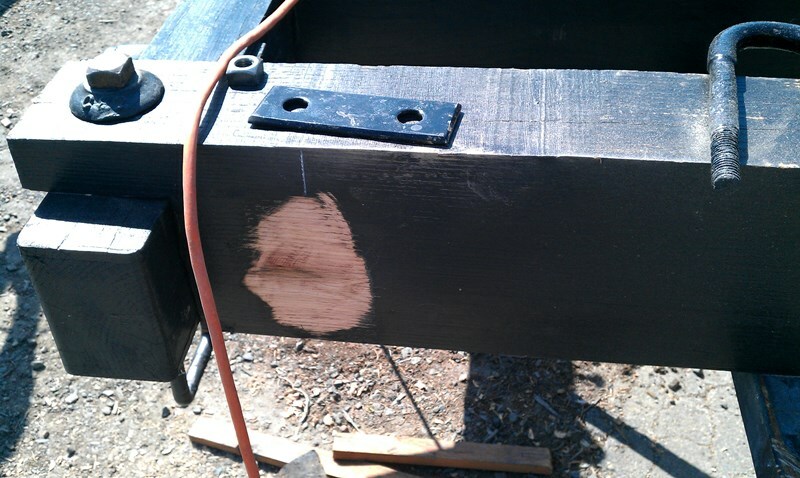 As the Restoration Team members were drilling the King Pin mounting hole through one of the bolsters, they discovered a two-inch-thick layer of rotten wood. 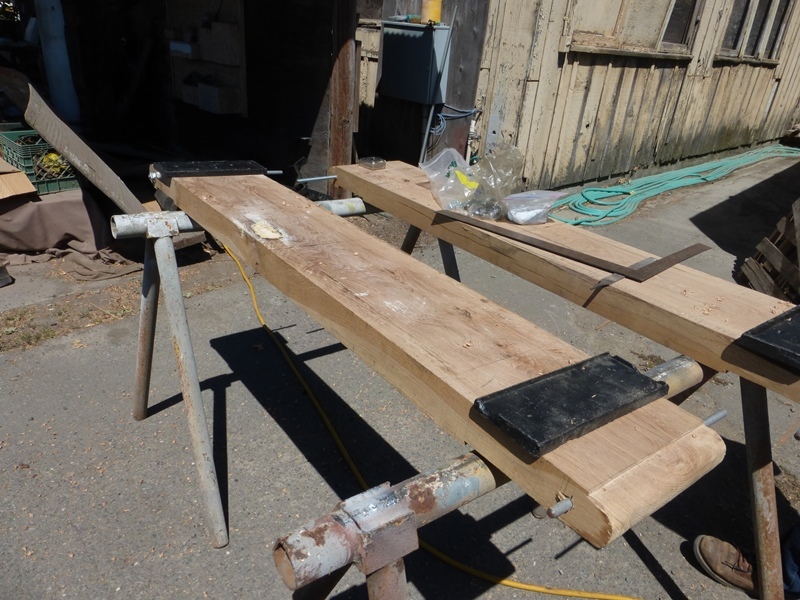 The vendor, Channel Lumber Company, of Richmond, CA, quickly provided a replacement bolster at no charge. 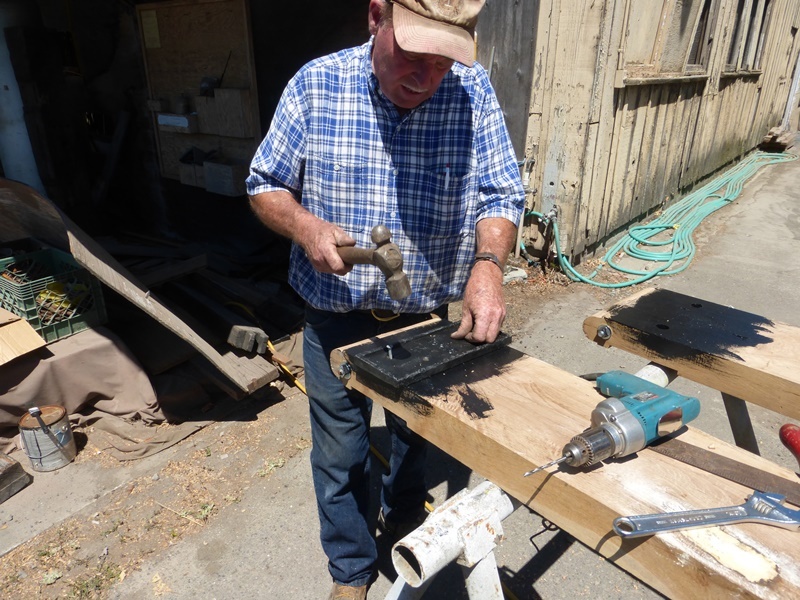 In April the Society submitted a matching-funds grant application to the National Railway Historical Society for $5,000, to help fund the creation of a set of patterns for the Master Car Builder 1873 Standard Pedestal, and cast eight pedestals for CP 29. We were informed in June our application was denied due to funding limitations. 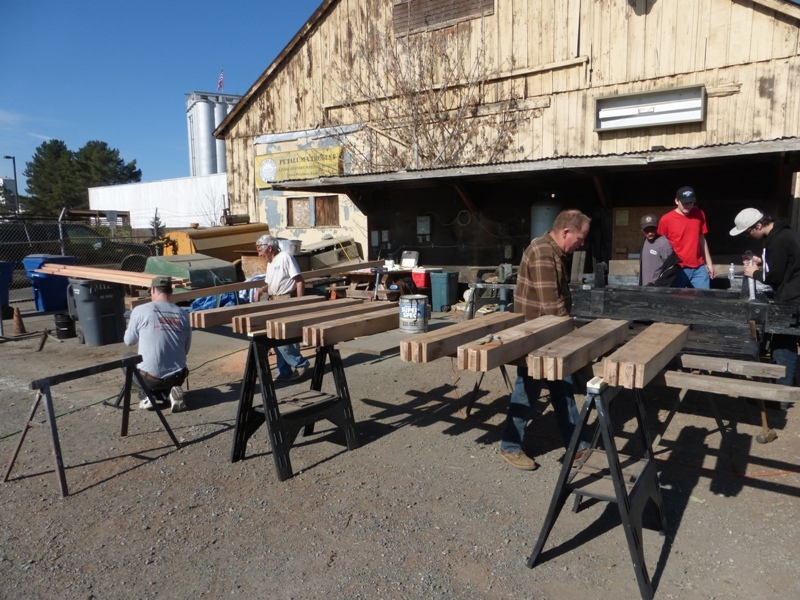 Although the lack of funding this year is disappointing, the NRHS did donate funds to help move CP 29 to Petaluma and help pay for the oak beams we used to make the new truck frames. A two-stage grant application was sent in early August to the Union Pacific Foundation (UPF), requesting $5,000 for the pedestal pattern and eight castings. We will be notified in February of next year if our application is successful. We may receive a grant for part of the costs, but we cannot count on that good fortune. As mentioned before, we are financing the creation of a pattern and the casting of the eight pedestals with our "Buy a Pound of Pedestal" campaign. Over $1600 has been raised so far - Thank you, donors! But more donations are needed to see our project through to completion. Your generous donation of $10 will cover the prorated cost of the patterns, steel, sales tax, energy and labor needed to cast one pound of a pedestal for CP 29 and bring it to the De Carli Trolley Museum. Please send a donation today so the Society can continue the restoration of this historic car. Photo 1: Spring plank before parts are attached. Photo 4: Lots of small parts to be cleaned up and re-fitted to the trucks. Photo 5: Picture of the truck under Sierra #2, also a Wasson Car. Photo 6: Jeff Millerick persuades a bolt into place.